The name Graves first appeared in the Middle Ages and derives from gravelly soil (terre graveleuse). The pebbles are picked up and placed next to the vines. They store the heat of the sun during the day and release the heat to the grapes until late at night. This naturally promotes the ripening process and increases the sugar content of the grapes. Another special feature is the rose bushes, which are planted at the end of each vine row. In the past, this was not done for visual reasons, but it could be used to treat diseases (eg mildew ) are displayed early (but is certainly not efficient enough today). Two-thirds cultivate red and one-third white grape varieties. Graves is the only region in France to produce exceptional red, white and sweet wines. The white wines are made from the varieties Sauvignon Blanc. Sémillon with something Muscadelle and Merlot Blanc blended. They are mainly dry and fresh. The red wines are from the varieties Cabernet Sauvignon. Cabernet Franc and Merlot produced, whereby the Cuvées are very different with the individual Châteaux. 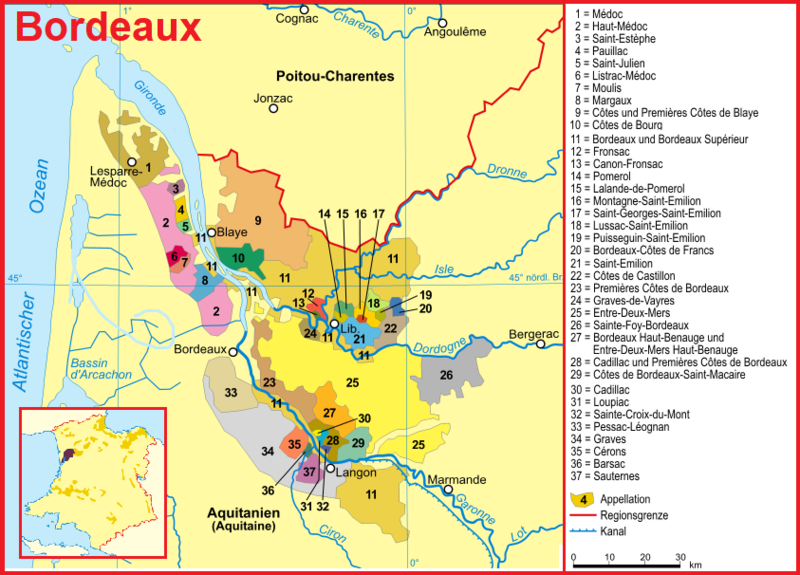 These are the typical grape varieties of the so-called Rive gauche (left bank).